What do you do while watching video? This new analysis from USA TouchPoints suggests that whichever platform you watch video on, there’s a good chance you’ll be eating, talking with friends and family or just relaxing. While the percentages of people eating, drinking and preparing food may be significantly higher for those watching video on TV, eating and drinking still occur in the top five activities of those watching video on mobile, computer or tablet. The nature of the eating and drinking may vary by platform. TV, being dominant in the home, is more likely to be accompanied by full meals -- as indicated by the fact that cooking /food prep is the fifth most common companion activity for this platform. The situation is likely to be reversed for mobile, due to the fact that mobility itself facilitates viewing in a wider range of locations. The implications for advertisers in related categories appear to hold across all platforms. 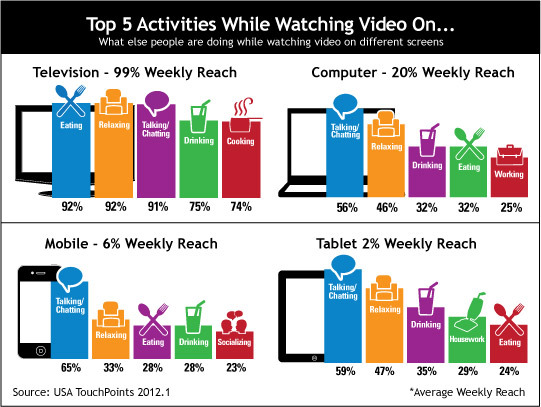 Watching video also appears to be a predominantly social activity when examined collectively across platforms. When viewing on the computer, mobile or a tablet, talking with someone else is the most common activity. Television talking (at 91%) is one percentage point off being equal to eating and relaxing as the most common activities. The 23% of people who also socialize while watching video on mobile also reinforces the social element to video viewing on this platform. Perhaps this is the social element of watching short clips on YouTube or sports highlights while out with friends. other space where TVs are less prevalent to run favorite content to break the tedium. Relaxing while watching video, which has always been the underpinning of the “lean-back” perspective on the nature TV viewing, is remarkably consistent in its ranking across all the platforms. It holds either second place or -- in the case of TV -- equal first among the top five activities while watching on any platform. Video would appear to be an ideal medium on any platform for reaching a relaxed, yet sociable consumer likely to be consuming food or drink in one form or another.